As Podcast listeners and those who’ve attended the Mark B Writing Livestream may be aware, I’ve recently begun dabbling in the world of exotic food subscription services, due entirely to the fact that I love weird crap, and Japan makes plenty of it. As random item subscription services are becoming more popular these days (with Lootcrate and Nerd Block leading the pack), it stands to reason that people are going to be casting more of an eye toward the “Japanese Snack” crates, if only to see what all the fuss is about. I’ve been trying out the two most notable services, Skoshbox and Japan Crate, and since they’ve both upgraded to sizes and “set release packages” recently, thus putting them on even footing, I thought I’d give the January crates a look and compare what you get for viewers, to give you an idea what the best value is for your money. This particular entry will focus on the Skoshbox, as it’s the one I’ve received most recently (Japan Crate generally ships around the fifth of the month), and the first Skoshbox to feature the Dekabox, which is their “super big size release,” more or less. Now, Skoshbox is the “less focused” of the two, in that it tends to aim for Japanese snack food in general, rather than aiming for any specific subcategory of snack food. The Dekabox comes with about seven food items, as well as a novelty item if you drop an extra $2 on said item. Skoshbox is also probably the less developed of the two, plan-wise; they offer two plans, the Skoshbox plan for about $10-12 per month which offers a bunch of smaller sized products, and the Dekabox plan for about $20-24 per month, which offers full sized products in similar variety. The Dekabox also lets you add on an accessory for $2 a month, which is also a mystery until it shows up, which I opted to sign up for, because we might as well see everything offered in one shot, right? 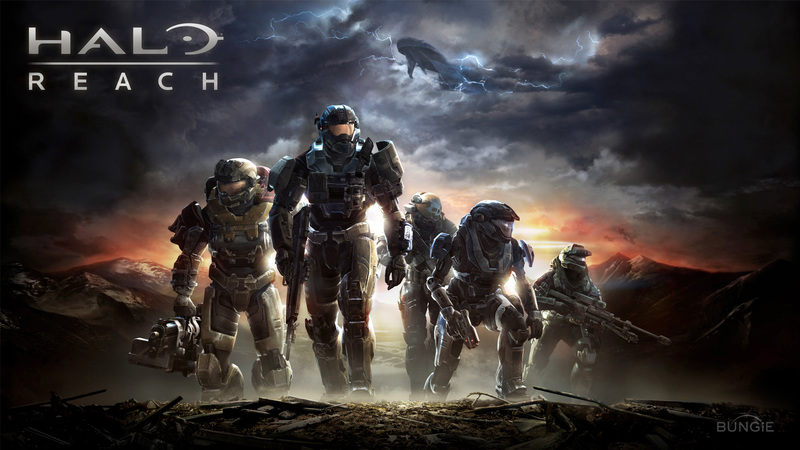 Well, my Dekabox for January just showed up, so let’s tear into it and see what’s what. Here’s the box in all its glory; the outside is decorated with various Japanese symbols, which is new for Skoshbox, as prior months were just plain brown boxes. 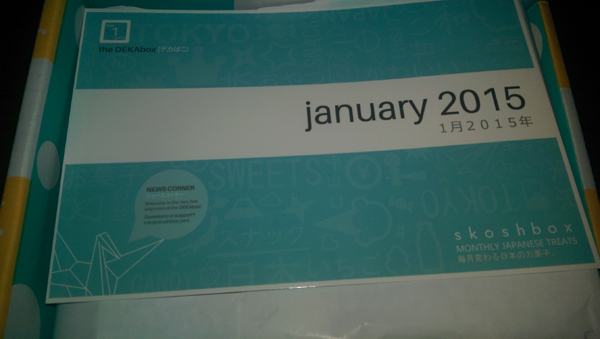 The inside is the same, however; the products are wrapped in tissue paper which is sealed with their logo, a picture of a 3D crane render, as well as a list of the products you’re getting this month. 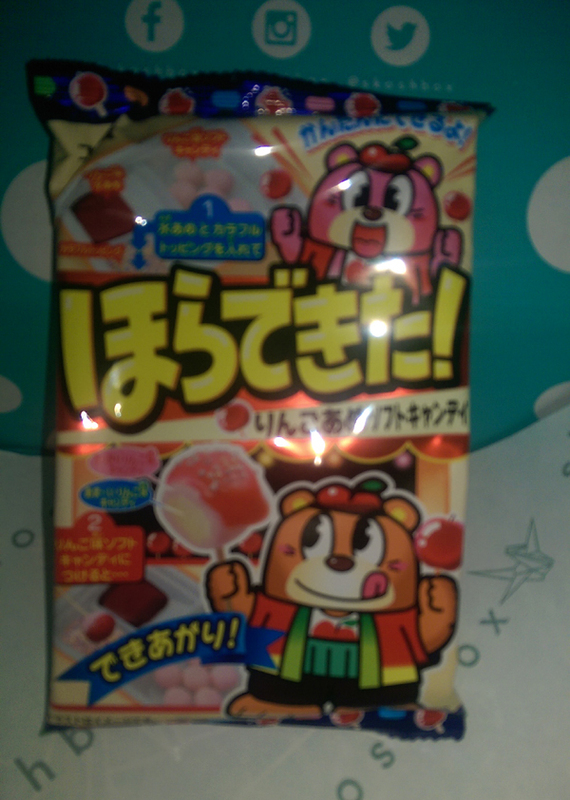 It’s professional and stylish, and almost makes you feel classy for ordering a box of Japanese snacks. The box also has a stamp on it indicating who packed your box; as mine showed up in good shape, I’d like to say thank you to Ayako for her proper snack food handling skills. You’re a credit to your random junk food boxing profession, truthfully. The list of goodies; we’ll get into each as we look them over. The actual goodies on display, freed of their packing. There’s nothing here protecting the food, IE bubble wrap or padding, for reference, but the exterior package is hardy enough to resist most exterior shocks and really, if someone drops the Macho Man elbow on it the food’s getting crushed anyway so that’s not a big deal. 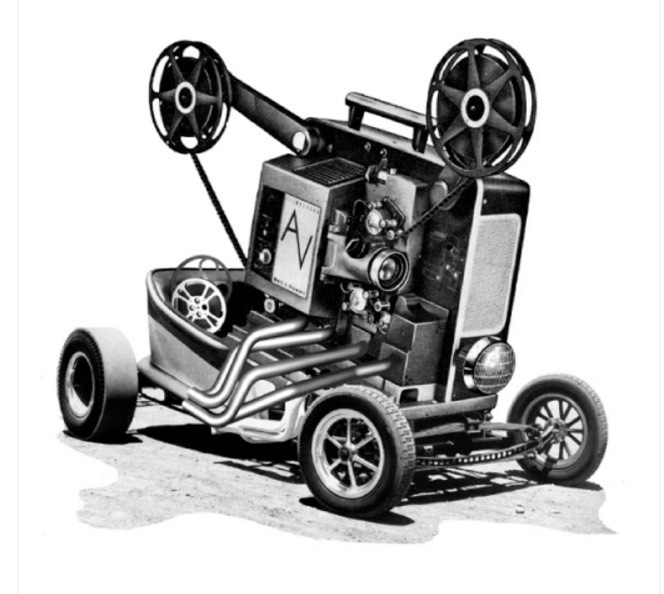 First up: our mystery accessory. 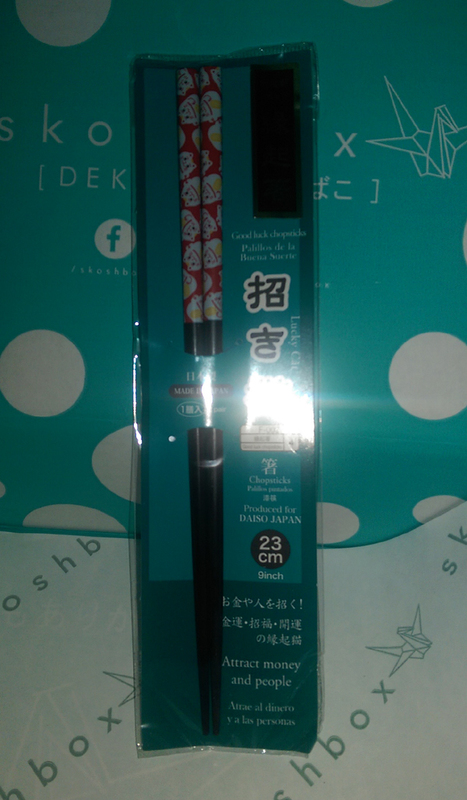 This month, it’s “Maneki-Neko Chopsticks,” or Lucky Cat Chopsticks. They’re cute and made of a decent quality plastic, and should probably survive a good number of chopstick-appropriate meals. The Lucky Cat also represents good luck in Japan, and I didn’t have a heart attack after eating all of this food, so I’d say it’s working so far. 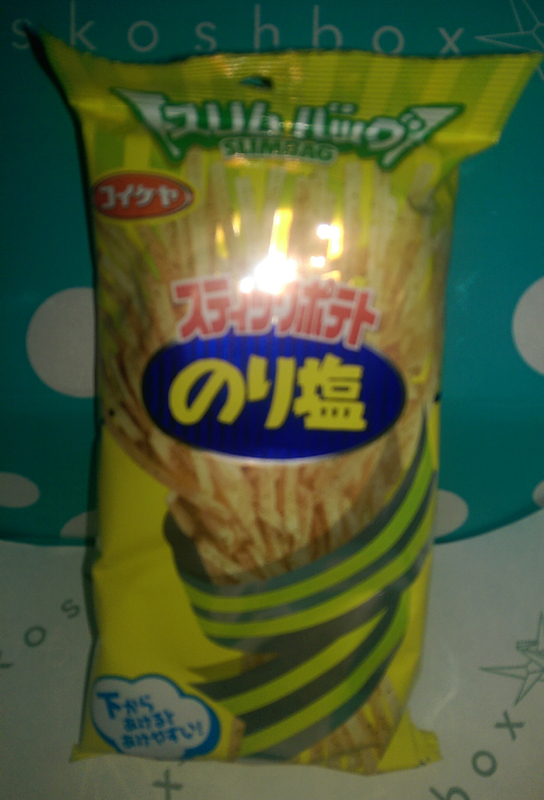 These are Potato Chip Sticks, according to the breakdown sheet, which says they’re “Nori and Salt” flavored. The package has a US nutrition label on it (as do most of the foods here), and states the package is 1.58oz and about 244 calories, of which 130 calories are from fat, so we’re off to a great start health-wise. The package also indicates that one of the ingredients is either Nori Chili, or else Nori and Chili are separate things; either way, it doesn’t impact the taste much. The chips taste like normal potato chips with a slightly spicy kick, and they’re generally pretty good all in all; I’d say that even if you’re not a fan of Nori (which I should probably explain is seaweed), you won’t notice it at all, and the final product is basically… potato chips. 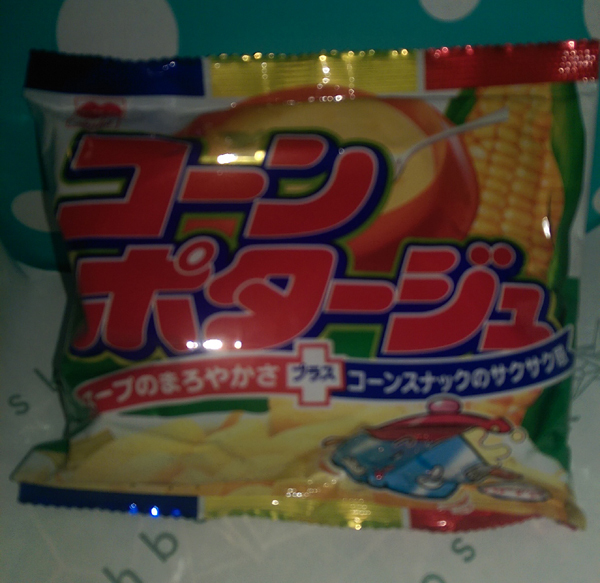 Next up we have “Corn Potage Puffs,” which are essentially meant to be puffed crisps that taste like sweet corn soup. I have no clue, man, but these are about 424 calories, of which 264 calories are from fat, so on top of being mildly confusing, they’re the worst thing for you in this package. As far as the taste goes… they taste like sweet corn soup, basically; it almost tastes like a cross between a snack food and a dessert, which is… interesting. I’d almost certainly never eat them on purpose, but as an experience they’re pretty great, if only because I can say I’ve never had anything like them in my life, and they were definitely worth trying out. 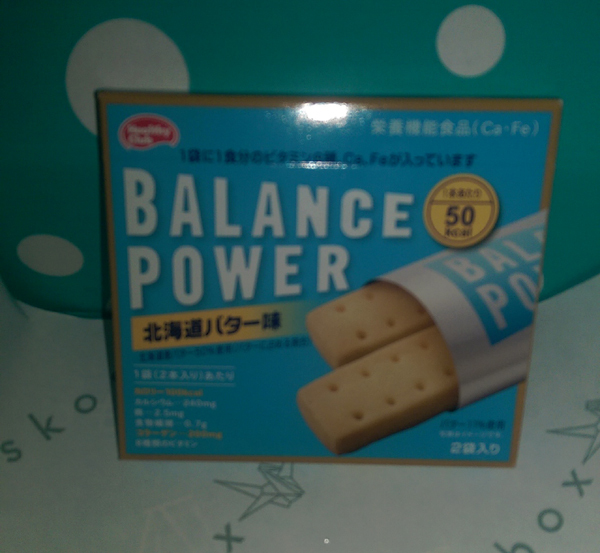 Next up are the “Balance Power Biscuits,” which are described as having “Hokkaido Butter Flavor,” and come in at about 200 calories for the whole pack (though I can’t tell how many calories from fat they have). In case you’re wondering about the taste, they taste like butter cookies, meaning that you probably know exactly what they taste like if you were in the US around Christmastime. They’re fine, but I’m honestly sick of butter cookies, so that might have been a better pick another month, but as of now, I’m kind of not interested. These are described as “Kumamoto Puccho,” which is a brand I’ve seen before from a Japan Crate; it’s essentially a chewy candy, often with colorful characters on the outside, and they’re not really comparable to anything the US markets right now. They’re quite nice as candies go, and the flavor included is described as “Banpeiyu (Citrus) flavor,” though it has something of a general citrus/pineapple flavor to it that’s rather interesting. I’ve never really had anything quite like it, taste-wise, and at about 150 calories for the total box, it’s not bad health-wise. 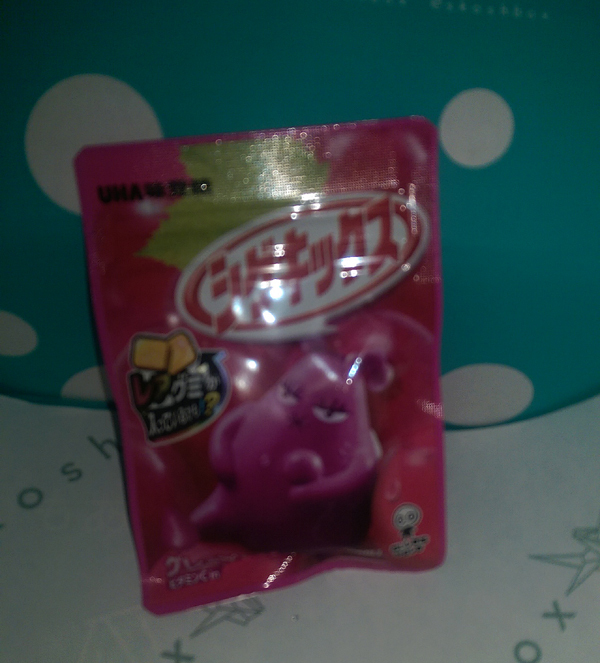 This is described as “Shigekix Grape Gummies,” which are essentially hard grape gummy candies coated with super sour powder, hence the asterisk on the creature’s face on the front cover (given what Japan usually uses the asterisk to indicate I was mildly concerned). They’re basically tiny Warheads, except the candy under the powder is chewy, and there’s twenty small candies instead of one medium-sized one. The whole bag runs about 62 calories, and they’re a good contrast piece, as the sour is pronounced and powerful, while the gummy underneath is subtle, sweet, and doesn’t taste like the fake grape flavor you’d expect. All in all they’re pretty tasty and it was a good pick. 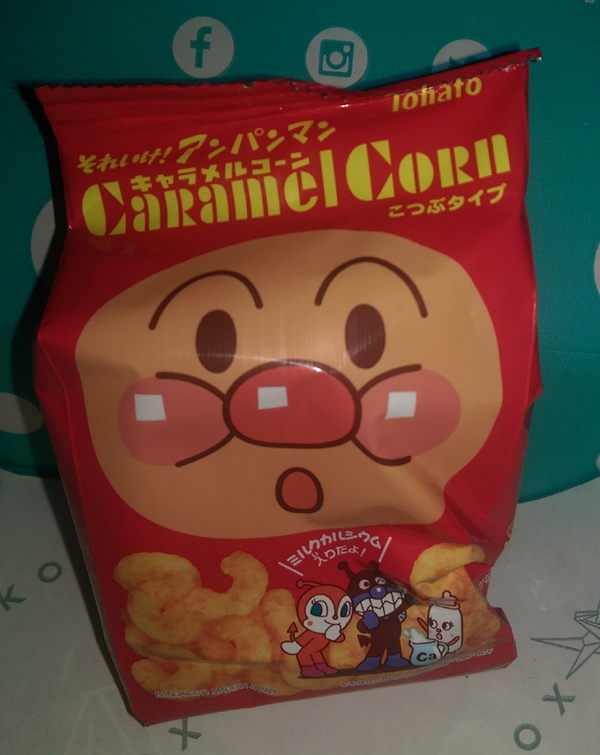 Our second to last piece here is “Anpanman Caramel Corn,” which is another popped puff snack, this time meant to taste like, well, caramel corn. At 336 calories for the bag, it’s by no means the healthiest snack in here, but it’s certainly one of the tastiest; it’s not too strong and has a distinct light, caramel taste in a fluffy corn pop. 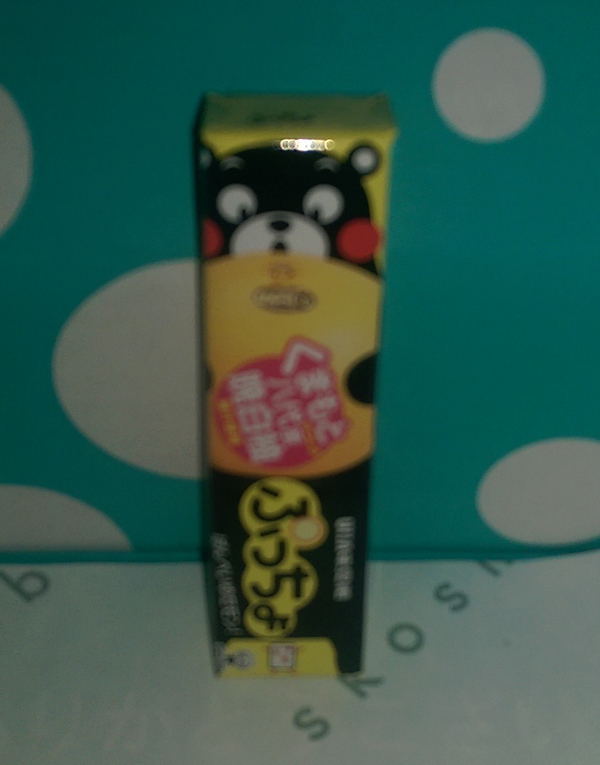 Anpanman seems to be some kind of snack food super hero, and while I don’t like it so much that I’d make a joke about saving my taste buds or something, I’d say that it’s a cute enough product, one I’d recommend. 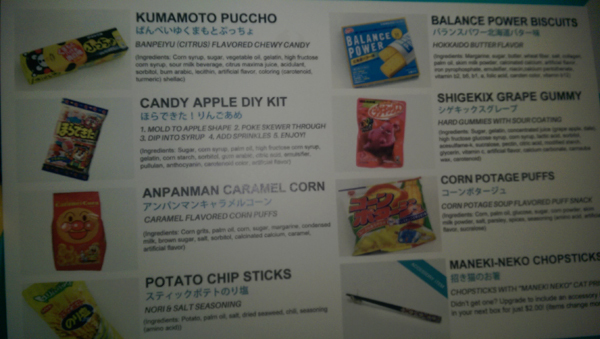 The last piece here is a “Candy Apple DIY Kit,” which I’ve seen before in the Japan Crate, and I absolutely loved this thing last time, so of course I loved it now. Japanese people (kids I’d assume) absolutely love their DIY kits, but the more involved kits go completely over my head. This isn’t one of those; instead, this one is simply a bunch of apple candies, a package of jelly, a package of sprinkles and a toothpick. You stab the toothpick into the candy, dip it in the jelly, then dip the jelly-side into the sprinkles, and taa-daa! A candied apple candy, ready to pop in your mouth. Simple, fun and quite tasty. It’s also worth noting that Skoshbox also has an online store on their website, where you can order the snacks you’ve received from them in larger quantities if anything strikes your fancy. They have the normal, expected classics (Pocky, Green Tea KitKat, and Mario and Pokemon themed candies) as well as Japanese rarities (Black Thunder, Umaibo Teriyaki Burger, Calpis Marshmallows) you won’t likely find on Amazon or in your local Asian grocer. The prices seem decent enough as well, so you’ll find that if you’re hankering for some Kirby Mixit Bubblegum, they’ve got you covered at a decent price. 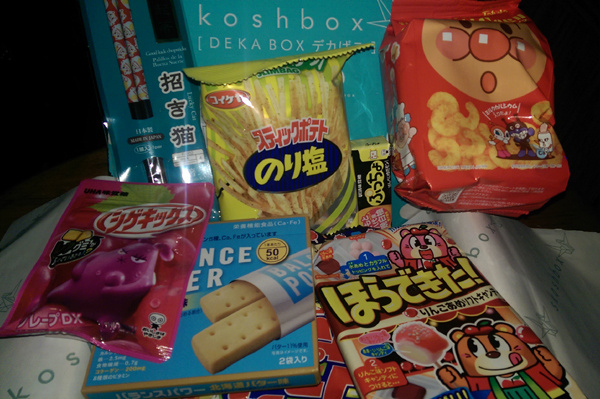 If you’re interested in a wide variety of Japanese snack foods, Skoshbox isn’t a bad service to subscribe to, and they offer you plenty of bang for the buck all in all. 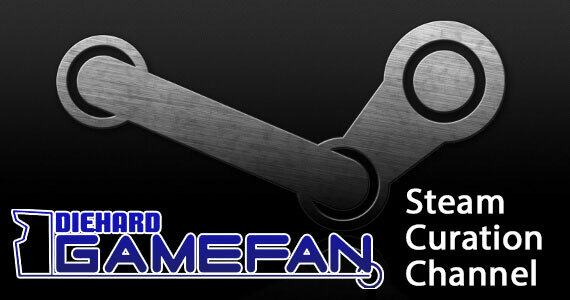 We’ll be back in around a week to check out the Japan Crate for the month of January, to let you know how it stacks up.